Taking the time to strengthen your abs is beneficial for so many reasons. Your core supports you in everything you do: picking things up off the ground, running, lifting weights, breathing, laughing, and even going to the bathroom. In order to function at your best, it's really important you give your ab muscles some TLC during workouts. I like the lying leg raise with a hip thrust because it's strengthening but it's also good for vanity purposes; it'll help you sculpt and define your abs. You won't have to do many reps before you feel it igniting muscles you've never felt before. Get ready to challenge yourself with this intense exercise. 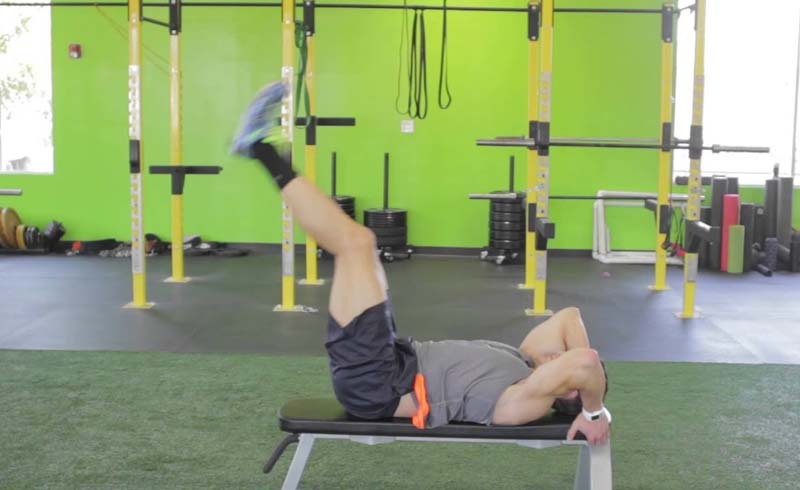 Begin lying on your back on a flat bench. Bend your arms, and grip the top of the bench. Your hands should grip the bench by your ears; keep your elbows in tight. With control, engage your core and lift your legs up toward the ceiling. Your hips should raise up and off the bench. Lower your legs back down to the starting position as slow as you can with control.